Mackay Blacks Beach Holiday Parks guest's can relax in a tranquil setting amongst majestic shade trees with absolute beachfront views at Blacks Beach. Set on five acres with a broad expanse of golden sands and blue seas, Mackay Blacks Beach Holiday Park makes the perfect place to get away from it all. Only minutes to major shopping centres, cinema complexes and sporting facilities. A hotel with bistro dining and other cafes are just two minutes walk away. Deluxe self-contained villas, offering queen size bed in the main bedroom. It has a bathroom, kitchen, lounge, dining, and television in lounge and main bedroom, Foxtel, air-conditioned and balcony. Linen supplied and villas are serviced weekly. Second Bedroom has a choice of configurations of either another queen bed, double bed with bunk on top or four bunk beds. 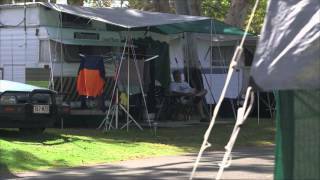 Mackay Blacks Beach Holiday Park offers park view sites with concrete slabs or C-Gear mats for all types including fifth wheelers. Large drive though sites are also available. Mackay Blacks Beach Holiday Park offer ocean view sites overlooking Keswick Island, Brampton Island and St Bees Island. Magnificent views of Slade Point also. Mackay Blacks Beach Holiday Park offers absolute beachfront powered and unpowered tent sites of all sizes with magnificent views of the islands and Mackay.